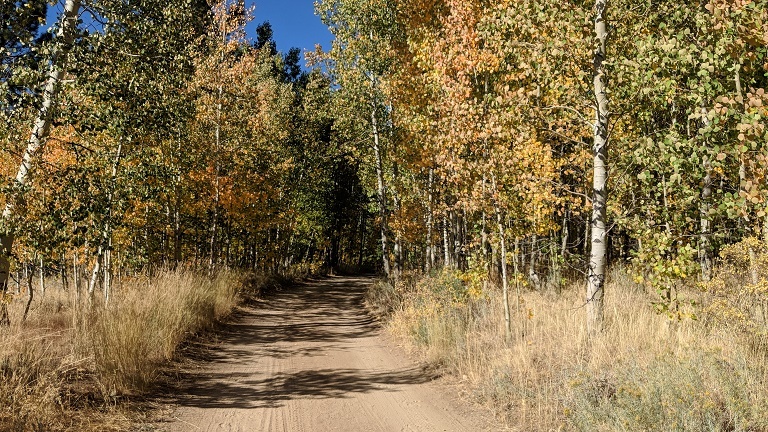 I haven’t written anything about my travels West in late September and early October. We flew into Las Vegas and drove up for a few days in Cedar City, Utah, where we saw many friends and spent time with our son and his family. 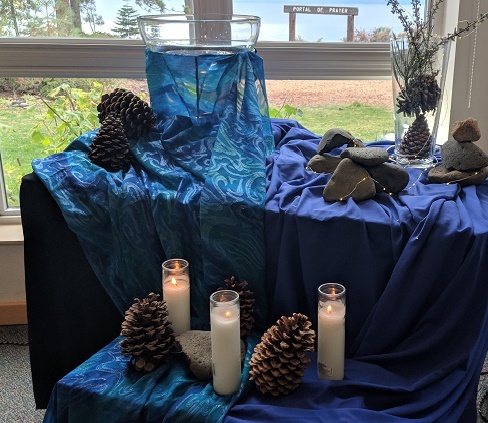 Then we drove across Nevada, stopping and spending a couple of nights in Virginia City, Nevada before going on to Zephyr Point Presbyterian Conference Center where I attended a seminar on multi-sensory worship. Then, as the story below describes, we drove back to Las Vegas for our flight home. I love traveling across the vastness of the American West. We leave Zephyr Point on Lake Tahoe late in the morning under a damp gray sky, heading south along the lake shore. Just before entering the city of South Lake Tahoe, we turn onto the Kingsbury Grade. The road twists down the eastern slope of the Sierras, leaving behind the tall pines as we enter into valley of sagebrush. Bands of rain from what had been Hurricane Rosa had move through, leaving the pavement wet. At Gardnerville, we headed south on US 395. It’s not the direct route to Las Vegas, but giving that we have a day and a half before catching a flight, it’s the route I chose. We gas up, but we’re not really hungry so we set our sights on Walker or Bridgeport for a late lunch stop. We pass Topaz Lake and enter California. The road parallel’s the Walker River. The country is wide open and the sagebrush glistens from the rain. We pass a sign for Monitor Pass and the turn-off for California 88. I’d driven that road before. In a way, this is haunted land. As the highway winds through the valley, the river off to our left, there are many. There are many charred acres from recent fires and some of the campsites along the river have been closed due to damage. It’s ironic, as I turn on my windshield wipers frequently as we pass through rain bands, to think of how this area has been in such a drought and have experienced horrific fires over the past decade. Twenty-some miles after the turn-off for Monitor Pass, we arrive at the junction for Sonora Pass. The Sierras are now closer, towering over us to our right. I’ve taken that road, too, a favorite pass over the Sierras. Highway 395 turns sharply to the southwest and works its way up over Devils Gate (one of many passes with this name in the American West). We continue on to Bridgeport, a western cow town sitting in the afternoon shadow of the Sierras. There we stop for lunch at the old Bridgeport Inn which sits next to the highway. 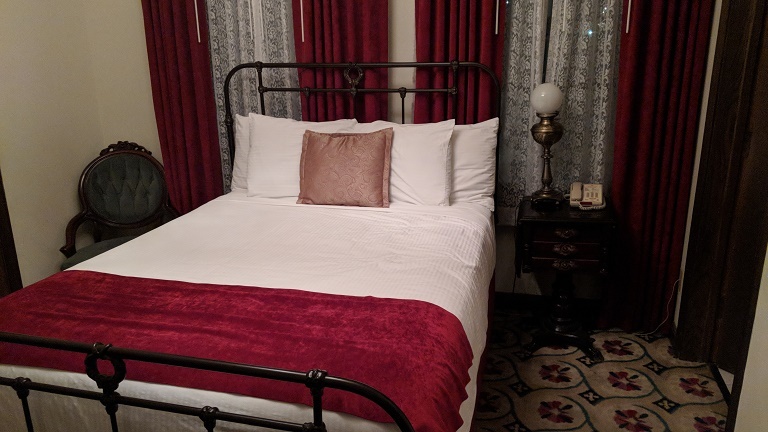 The inn, with a downstairs dining area and rooms upstairs, has been around for a while, having started as a stagecoach stop in 1877. Sitting by a window, we watch what little traffic there is pass by on this dreary and rainy day, as we enjoy our sandwiches and listen to a man at the bar try to arrange a pickup of his brother’s wrecked motorcycle. Forty-five minutes later, we’re back on the road, heading south. We pass the turn-off for Bodie, an old mining town that sits high up in the mountains to the east, just west of the Nevada border. I’d like to revisit the town, but there’s not enough time and the rain would make it pretty miserable. At Conway Summit, I pull off the road and get out in the misty rain, enjoying the cool damp air that enhances the smell of sage. 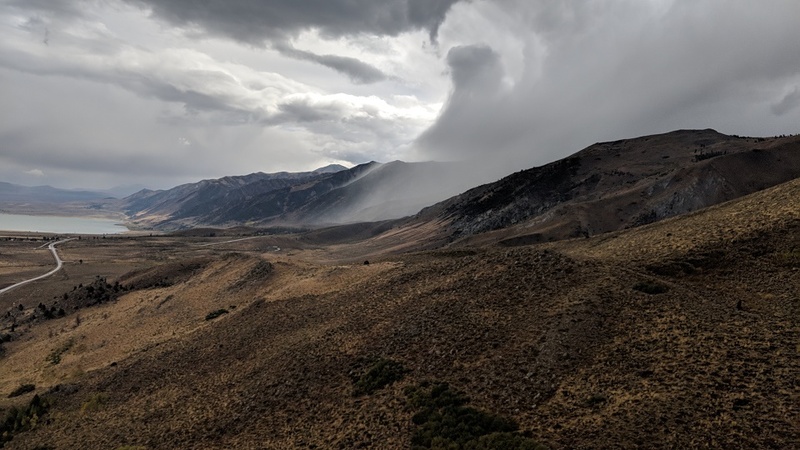 The clouds pushing through Sierras keep the light constantly changing, providing unique views. Below us is Mono Lake. 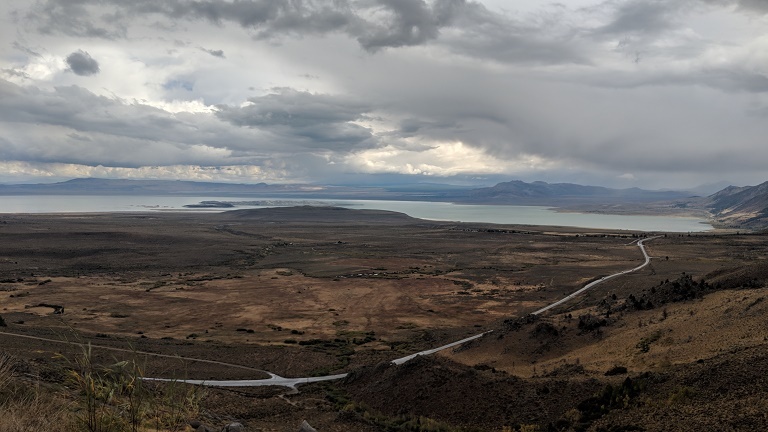 Like man lakes in the Great Basin, it has no natural outlet as the water the flows into the lake is left to evaporate as it does in the Great Salt Lake to the east and Pyramid Lake to the north. With no natural outlet for the water to flow, the water evaporates and leaves behind a concentration of minerals. After a few minutes of walking around, I continue driving on toward Mono Lake. We stop at the new museum on the north side of Lee Vining. I don’t think this was here the last time I was here. Afterwards, we drive through town and I pass the western turn-off for California 120, which winds up Tioga Pass and into Tuolumne Meadows. It’s one of my favorite drives and it has been 20 years since I last made the drive after having completed hiking the John Muir Trail. But there is no time today, so I continue south and five miles beyond the town, turn east on California 120. At the South Tufa area, we stop and take the mile long hike through some of the unique tufas, which have been created by calcium springs bubbling up in the alkaline water of the lake. The resulting reaction creates limestone sculptures under water. The tufas become visible when the water level drops, exposing the torturous sculptures. For much of the last 100 years, the water level has dropped even more dramatically, as the streams flowing into the lake have been tapped to quench the thirst of Southern California. 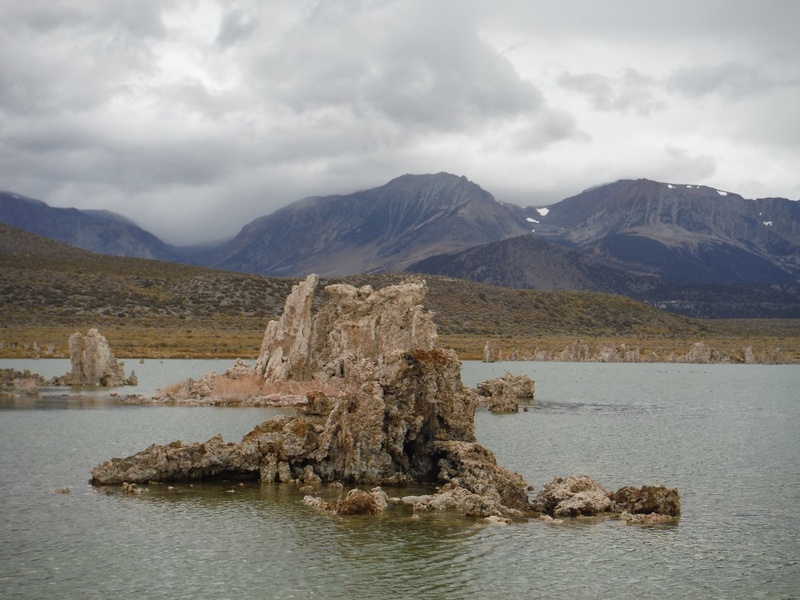 In the mid-1990s, after years of court battles, environmentalist won a lawsuit that has forced Southern California to restore some of the water coming into Mono Lake so that the eco-system can remain in tack. This is an important rest stop for migrating birds that feed on the brine shrimp that flourish in the water and the brine flies that hover around the edge of the beach. 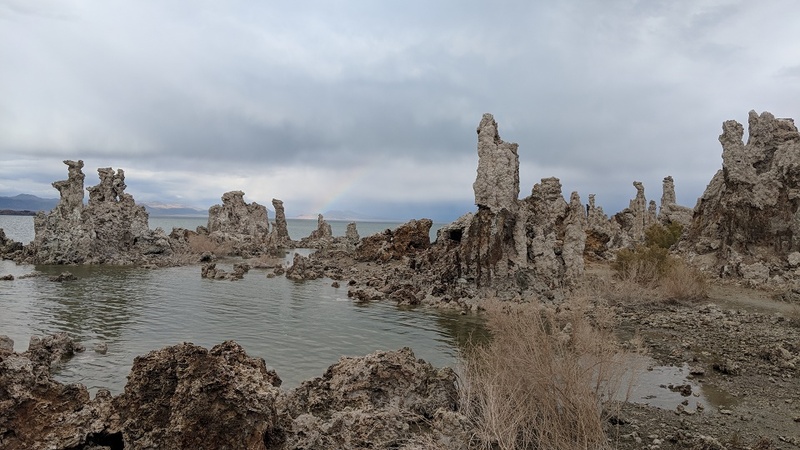 As we walk around the tufa field, the clouds begin to break up and with the sun dropping in the east, partial rainbows are seen in the east. Leaving the tufas and the lake behind, we continued west on California 120, passing the Mono Craters. This small range is considered one of the newest mountain ranges in the world and volcanic activity here has been as recent as 300 years ago. The highway runs through Inyo National Forest, passing young Jeffrey Pines as the more mature trees were cut and transported to Bodie where the timber were used to build the town and to sure up the mines. This road has the feel of a roller coaster with many short rises and drops that gives my gut the sensation of rising above the car as it the vehicle drops. Highway 120 comes to an end shortly after Benton Hot Springs. This small town was once a retreat for miners, and there’s still a small rustic resort here. As daylight is waning, there is no time to stop, but in the past I have spent time here enjoying a nice soak. Instead, we take a left, turning onto US 6, and begin climbing over Montgomery Pass back into Nevada. As we climb, I notice the cuts where the old Carson and Colorado Railroad once ran. This line was scheduled to be abandoned in 1942, but after Pearl Harbor it received a short reprieve as the government felt the country could use it as a north-south rail line safely east of the Sierras if the Japanese attacked the west coast. After the war, the line was abandoned. The sun begins dropping behind Boundary Peak and the White Mountains. The highway merges with US 95, which runs from Reno to Las Vegas. This is barren country and radio stations are few and far between. Finally, up above next to Sawtooth Mountain, we can make out the lights of Tonopah. In 1900, Jim Butler, a local rancher, supposedly picked up a rock to throw at his stubborn donkey to get it moving. 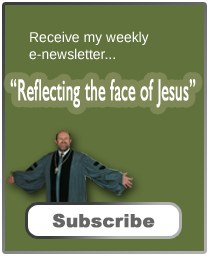 Noticing the rock was heavier than expected, he saved the rock (and thereby saved his beast from a stoning) and had it assayed. It contained silver and gold. Another legend is that a friendly Native American told Butler were he could find such rocks on the ledge of Sawtooth Peak, which led to the discovery. By whatever means, Tonopah boomed after the discovery and soon the mountainside was dotted with claims. One of the richest, claimed by Butler’s wife, was the Mizpah, a name taken from the Bible. As the town boomed an extension from the Carson and Colorado ran into the town from the north. Soon, two more rail lines came up from the south, the Las Vegas and Tonopah (which roughly follows the route US 95 takes today, and the Tonopah and Tidewater, which ran up through Death Valley Junction. Throughout the 20th Century, Tonopah had many booms and busts. After the mining played out, the military moved in as the city sits just east of the Nevada Test Range. There were nuclear test and later the B1 bomber was tested near here. Each of these events led to a renewal of activity for the town. The town is also a halfway point for those traveling by highway from Las Vegas to Reno. 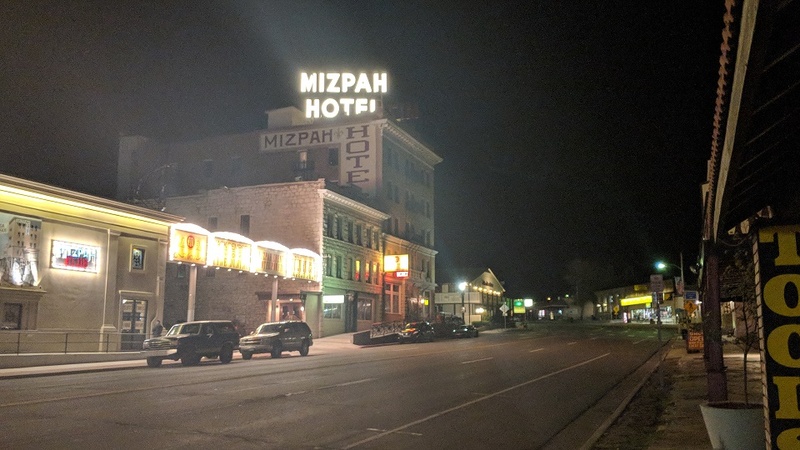 We stop at the Mizpah Hotel for the evening. I had eaten at this hotel a few times in the past, but the last couple of times I’d been through the area and was hoping to stay there, it was closed. I learn the Cline family, who own California vineyards, had brought the hotel, after remodeling, had opened it back up. The place is magnificent and looks as it might have appeared in the early 1900s. Supposedly the hotel has its own ghost, of a woman who was killed by her lover. The murder supposedly occurred on the fifth floor and since our room is on the fourth, we didn’t have the pleasure of meeting her. 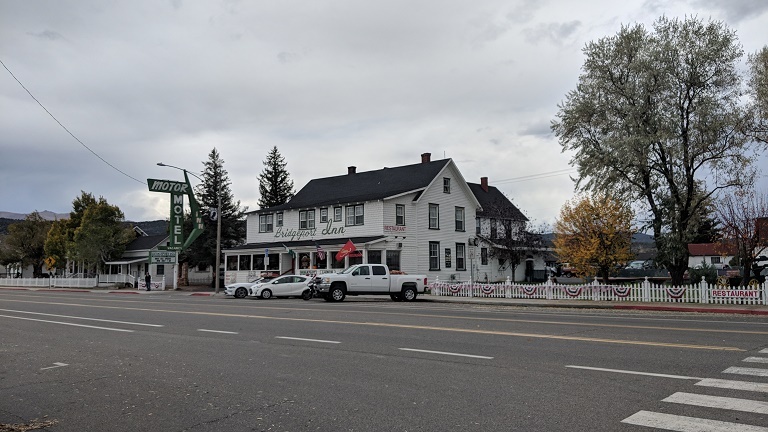 We eat in the dining room and afterwards, I go out and take a stroll up Main Street before coming back and enjoying an Irish Red brewed by the Tonopah Brewing Company, which is just down the street from the hotel. Talking to the bartender as I watch baseball playoff game on the television, I learn that the same family that owned the hotel has also established the brewery. 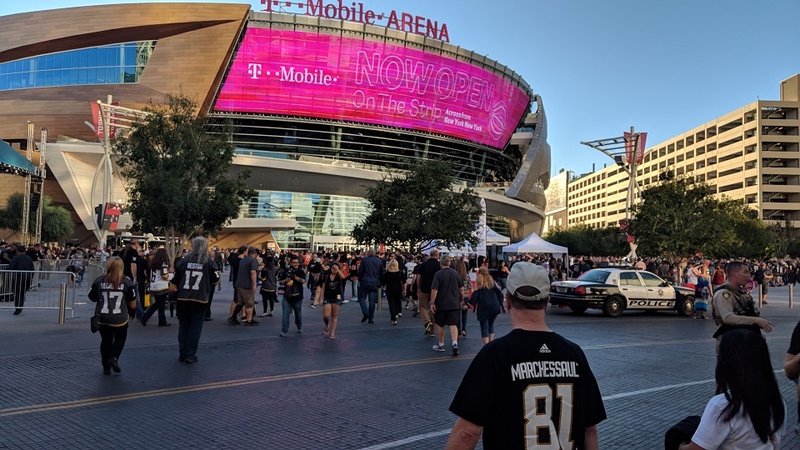 In the morning, we decide to make a quick run to Las Vegas in order to get there in time to “meet the team” as the Las Vegas Knights arrive for their first game of the NHL season. The four hour drive takes us through Goldfield, Beatty, Indian Springs and then into vast metropolis of Las Vegas. While I’m not the hockey fan, my wife and daughter are. 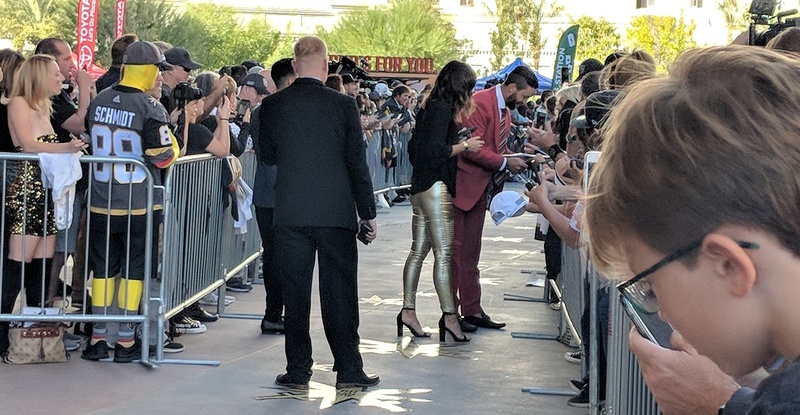 I take a position opposite Donna, so to get a different view of the players and coaches as they enter the arena. I snap at least a 100 photos as every 10 or 15 minutes another player or coach arrives. 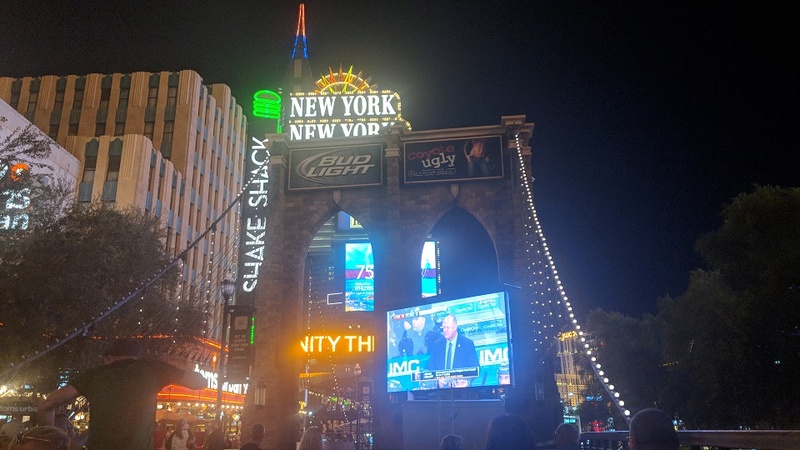 Afterwards, we have dinner and catch part of the game at an outside bar at the New York, New York Casino before heading to the airport for a red-eye flight back home. Gorgeous photos and that view from Conway Summit is spectacular. I’m always fascinated by interesting cloud formations. Our whole family enjoys Vegas and we’ve visited a number of times. 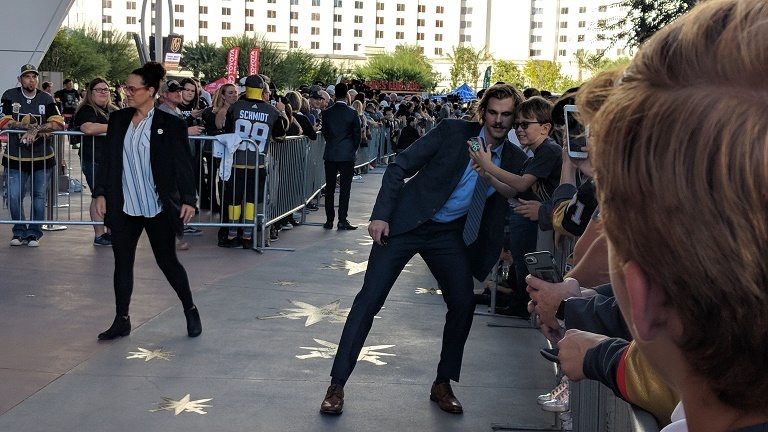 I hope you had a good time here in Vegas. I’ve lived here more than 30 years and haven’t been on the Strip or downtown in years. Used to go down there all the time I guess I got burnt out on it. The picture you took are great! You got some amazing shots. Stunning photos. Sounds like an amazing trip. Thanks for sharing. Happy Thanksgiving with all of yours ! Awesome Pictures! I want to travel in the western states someday. Being stationed at Fort Carson Co, back in the 1980’s was fun during the summer. Didn’t really care for it during the winter months though. Nice! You relished in some of the West Coast highlights. 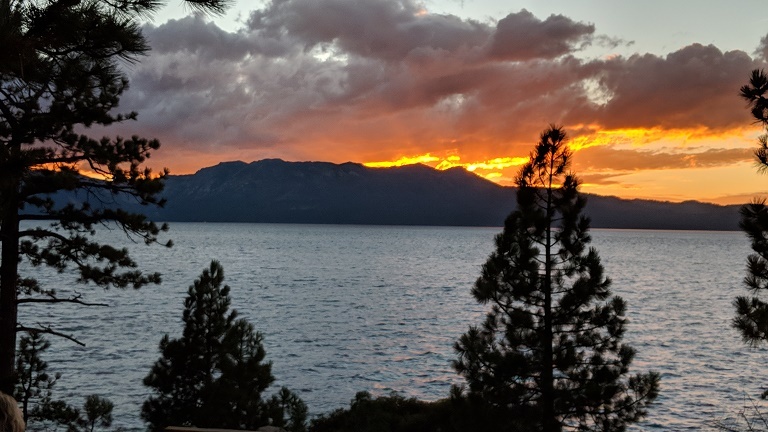 Tahoe is one of my favorite spots. Great pictures and even better narrative, Jeff. I love trips like that. Can pretty much taste that Irish Red you described. Sounds like a great time. I’ve been to some of these places! I used to watch tons of hockey when I was a kid/teen, but I had to cut back as an adult because there are too many games. I still watch Avalanche games a few times a month. They’re actually doing well this season! That’s unusual. It sounds like you had a good trip. Lovely photos, as always.